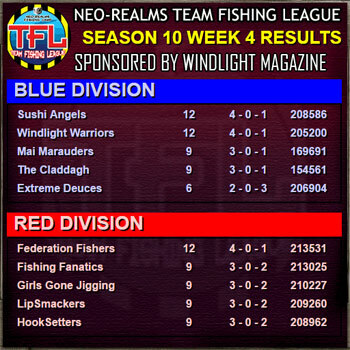 After week 4 we have a 2 way tie at the top in Blue Division between Sushi Angels and Windlight Warriors. In Red Division Federation Fishers hold a slim lead with a ton of teams only a game behind. Good luck to all fishers for week 5! Week 3 is done and Windlight Warriors maintain their lead in Blue Division, while Fishing Fanatics and Federation Fishers share the top spot in Red. Good luck to teams this week! 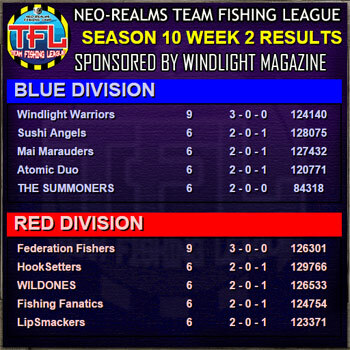 Week 2 is done and Federated Fishers have maintained their undefeated streak in Blue Division. In Red Division: Windlight Warriors, THE SUMMONERS and The Claddagh maintain their undefeated positions as well. Good luck to all teams for Week 3! Season 10 is underway and we have the first week's results in! Good luck to all teams next week! TFL schedules has been posted! The first match will be posted by next Sunday, and a double header for Week 2 is also available for fishing. If you do not see all 3 matches, you may have a bye for that week.